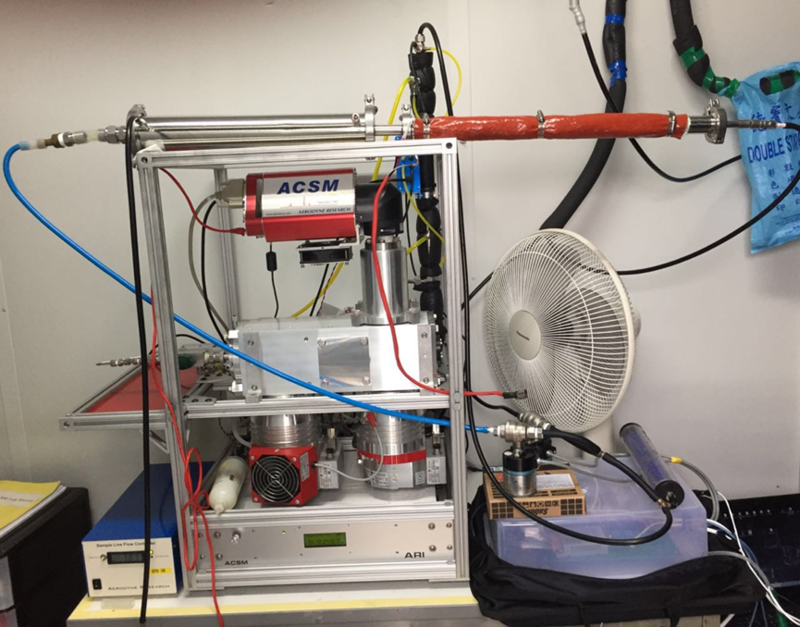 Simultaneous measurement of black carbon (BC) and other PM1 aerosol chemical compositions was performed using an Aethalometer (AE33, Magee Scientific Corporation) and Aeroyne Aerosol Chemical Speciation Monitor (ACSM) in urban area of Hong Kong. A thermodenuder (TD) was employed in tandem with the AE33 and ACSM at different heating temperatures (i.e., 50°C, 100°C, 150°C, 200°C and 280°C) to remove semi-volatile aerosol fractions (i.e., coatings) by different degree. Result shows, with increasing heating temperature, more and more semi-volatile species were evaporated, e.g., from 50°C to 200°C nitrate and organics were mostly vaporized, whereas ammonium and sulfate evaporated until 280°C, showing relatively low volatility. Meanwhile, we evaluated light absorption enhancement (Eabs) of BC by coatings in seven wavelengths from UV to near IR, based on BC measurement of non-heated and heated aerosol. Results showed Eabs increased very little from 50°C (1.02 – 1.04) to 200°C (1.13 – 1.20), but surged to 1.58 – 1.64 at 280°C, probably attributed to the presence of low volatility inorganic components such as ammonium and sulfate, which might be associated to lensing effect on BC light absorption, implying the presence of internal mixing of BC with coatings. The absorption Angström exponent (AAE) had slight increase after heating, possibly due to higher light absorption for low-volatility brown carbon at short wavelength. Inverse calculation by Mie calculation showed imaginary part k of BrCLV was around 0.02 ~ 0.15, much higher than that of overall coating (i.e., 0.006), indicating extremely higher UV absorption for BrCLV. Furthermore, Mie-calculated coating fraction (i.e., ratio of thickness of coatings to radius of BC core) for BC-containing particles was around 100% ~ 200% assuming coatings were evenly surrounded onto BC, i.e., internal mixing.